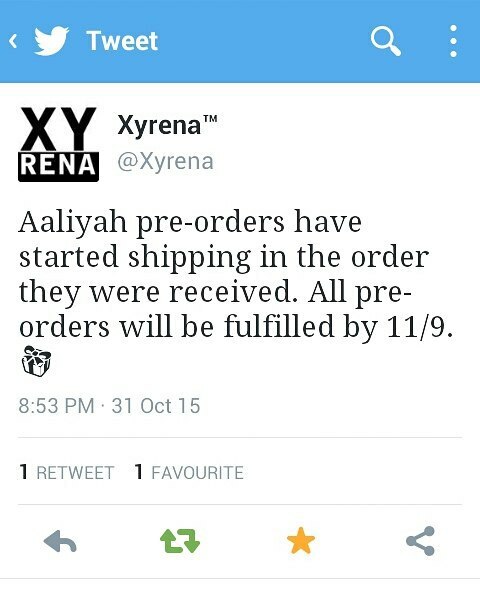 "Thank you for your recent purchase of Aaliyah by Xyrena. This e-mail is being sent to all customers who’ve pre-ordered either Aaliyah Extrait de Parfum or Aaliyah Vibe Spray. Pre-Order: There has been some confusion by customers inquiring why their order is still “Processing” or why they haven’t received their order. As listed at the top of the product page, Aaliyah is a Pre-Order not available for immediate shipment. By placing a pre-order you have guaranteed your place in line to receive the product as soon as it’s available. Shipping Date: Xyrena is a new brand and we’re in the process of upgrading our Extrait de Parfum packaging to an innovative luxury travel case that’s shockproof, waterproof, reusable, and all around awesome! Due to an unforeseen delay beyond our control we won’t have these new cases in stock until the end of this month. Our estimated ship date for Aaliyah was originally mid-October but due to our upgraded case delay we’re now anticipating that orders will ship on October 30th. We apologize for the delay and understand everyone is anxious to receive the Aaliyah fragrance. We’re also upgrading our labels to a more smudge resistant material for all Extrait de Parfum and Vibe Spray’s. If for some reason our cases don’t arrive for shipping on October 30th than customers will have the option of either waiting until they arrive or having their Aaliyah Parfum shipped in a standard cardboard box. Customer Service: Please do not send individual requests inquiring about the status of your order. Once your order ships you’ll receive a “Completed Order” e-mail and may track the shipment through your Xyrena account. Please bear with us, we’ll be shipping all orders ASAP and think you’ll agree that it’s well worth the wait!